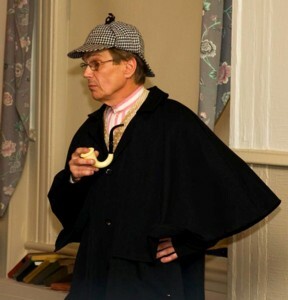 Cape May's bi-annual Sherlock Holmes Weekend, sponsored by the Mid-Atlantic Center for the Arts & Humanities (MAC), returns with a new mystery for 2011: The Case of the Surreptitious Ghoul. The first weekend will take place from March 18-20 and the next weekend will be in November (photo by: Joe Evangelista). Cape May’s bi-annual Sherlock Holmes Weekend, sponsored by the Mid-Atlantic Center for the Arts & Humanities (MAC), returns with a new mystery for 2011: The Case of the Surreptitious Ghoul. The first weekend will take place from March 18-20 and the next weekend will be in November (photo by: Joe Evangelista). Sir Arthur Conan Doyle’s master sleuth, Sherlock Holmes, ponders the evidence to a baffling new mystery for 2011, “The Case of the Surreptitious Ghoul,” during Cape May’s Sherlock Holmes Weekend, sponsored by the Mid-Atlantic Center for the Arts & Humanities (MAC), Friday, March 18 through Sunday, March 20 (the next opportunity will be in November). Join the famous detective and his partner, Dr. Watson, as they explore the Gothic Habitants of Underground London Society, or G.H.O.U.L.S. for short. Mystics, mediums, murder and mayhem abound in this bleak world. The duo will need your help as they peer deep into the darkness and face the fears that lie within. Thoughout the weekend, participants will get in on the chase during the Search for Clues Tour, vie for prizes, and enjoy performances, lunch and an optional theatrical production. Full weekend packages are available at $180 per couple or $95 per person. 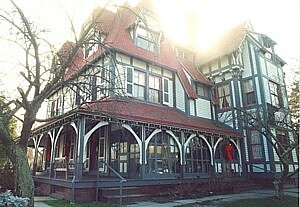 Overnight packages with accommodations are also available. Call 609-884-5404 or 800-275-4278, ext. 185 for more information or to reserve your overnight package.